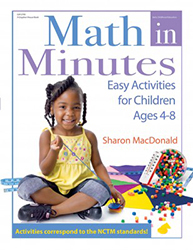 This engaging, exciting introduction to early math concepts will be a sure-fire hit with young children. They can go on a Geometric Shape Hunt, measure with Pompoms, or find the Missing Numbers-just a few of the fun, simple activities you'll find in Math in Minutes. Each chapter begins with the easiest activities and progresses to more difficult ones. Many activities offer a way to "Take It Up a Level" for children who want a challenge. The chapters in the book are organized by math concept and each activity relates directly to the National Council of Teachers of Mathematics standards, which are listed in the appendix. The activities use easy-to-find materials available in any classroom. Each activity begins with "Math Objectives that Meet Standards" to help teachers meet the standards set by their state. The book also includes unique tips and insights from an experienced teacher that will benefit new and experienced teachers alike.